I spent most of yesterday finding, selecting and then collecting my Fathers Day present one week early. A touch unusual for a fathers day present I know, but a damn site more permanent than a "Worlds Best Dad" coffee mug. It's still looking a little but sore and it's a little scabbed over, so I'll post another picture once it's settled down. That's a cool looking tat you got yourself there! 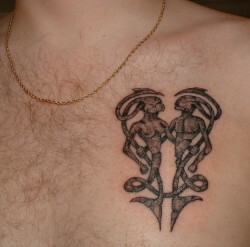 i dont know what you was thinkin when you got this but it looks like 2 aliens from alien vs. predator on your damn chest. now maybe im bent outta shape but i thought this was a fathers day thing you feel me? this is just my opinion aint nothin im sayin law you feel me?